I just finished this table runner for myself. I think I'm in love. I like whimsical and this fits the bill. When I saw this in my local LQS I bought it immediately, and I have other fabrics from the line to make myself a quilt of some kind. I have a few ideas but can't seem to commit to a design. Something will come to me I'm sure. This is the overall shot. 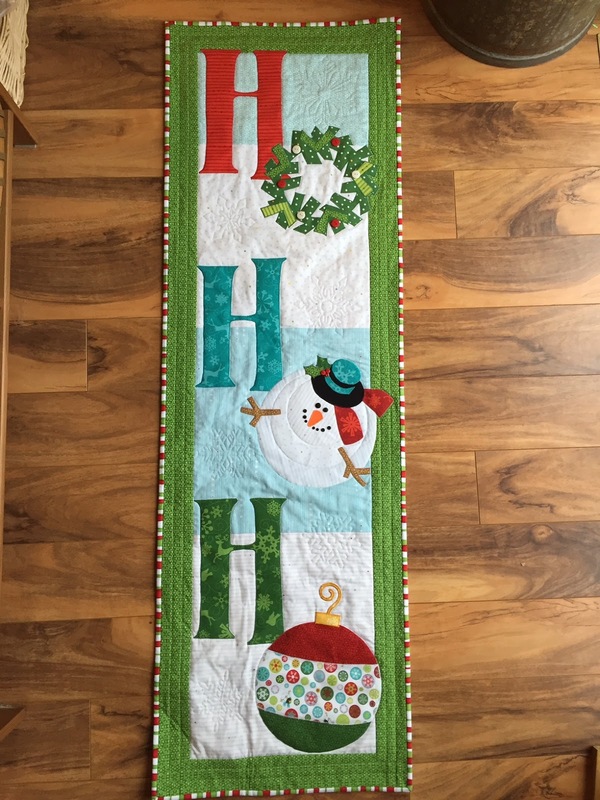 The fabric line is called Ho Ho Ho, but I don't remember the designer. This pattern comes from a book that uses this fabric line. I quilted straight lines in the green borders and around each letter and shape. Then I added some snow flakes - I'm very proud of them. Each snowflake is different. I used my usual method of tracing a design onto the paper on the table at the doctor's office. Then I quilt it and tear off the paper. This is a good example of selfish sewing for me. There will be more of this in my future - I'm naming 2016 as my year of selfish sewing - more on that later. Thanks Lynn - I'm really happy with it. Glad to see you back on your blog... love, love your snowflakes-awesome job.. and the whole table runner is adorable. Hope to see you in the New Year. Have a good one Anita!! Thanks Maria - it's good to be quilting again.